Will be announced the week of December 19th. What time does Wrestling start? Will any of this be live streamed? If so, is it on a pay site? Fan in Alabama willing to watch all day waiting for this answer too! The IHSWCA has decided to not live stream. 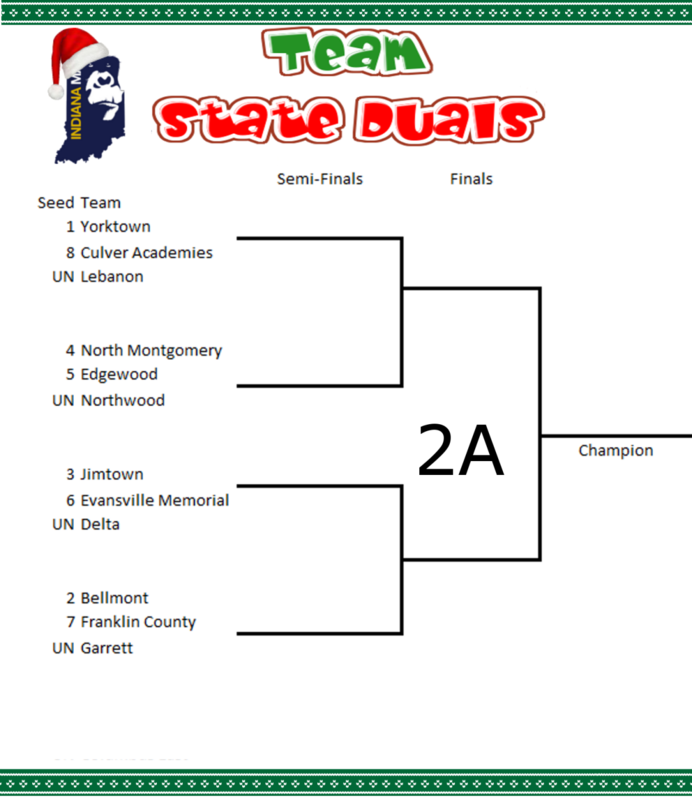 Though both people who live stream the individual state finals will be in attendance, in case they were to change their minds. For all the parents and relatives who can't make the trip, this seems like pretty much a horsesh*t decision. I'll happily retract if someone can give a real answer as to why that decision was made other than it might affect ticket sales! Ugh...I get the ticket $ aspect if that's the reason but this is not how to grow the sport. #TheCounty's favorite uncle will not be there... What!!?? How and when will we do our gift exchange. I'm sure that Jmill has something special to give to his favorite uncle. Also... I know that team Garcia made a special trip to mr b's cigar shop for ya. Cmon man! Dude, I'm gonna be there! Wouldn't miss it. Just sayin' it doesn't make sense to not make it available to those who cannot attend for various reasons. I don't feel those who have a kid in it or some type of connection that can go to the event, won't just because it is live streamed...but those who can't can still enjoy it via that technology if they are too far away or can't make the trip due to various reasons. Any My Family Los Antilles type cigar will do...I ain't picky! I wear a size XL for my #ILuv#TheCounty tshirt! I'm always available for a meet and greet with my #TheCounty people. Streaming would have no influence on growing the sport. The ones watching a live stream are already fans of wrestling. Most likely they are watching because they are unable to attend due to work, or in this case being so close to Christmas. But probably 90% of the people that would be watching a stream are doing so because they don't want to make the trip and pay to get in, or spend a whole day in a seat. So again, streaming this event has no influence on growing the sport. Maybe being better fans and attending is a way to grow the sport. Thank you #PainTrain for live streaming your recent dual vs #TheOtherCountyTeam for FREE!! But that was clearly a mistake and did nothing to draw more interest to your program, which in turn might increase youth/parent involvement and #'s. Not sure why MMA events are pay per view...all the people watching are already fans and should go to Vegas to watch, yet it started as basically a garage "fight club" and now sold for billions. Guess that isn't growth. More revenue doesn't grow a sport via advertising and getting the word out that it's cool. What was I thinking? PS..Sorry can't let this go. It's called marketing. This is a really cool event. You're telling me that if there are 500 more eyeballs on this tourney via track for $10 and they see this event and feel the excitement/intensity thru their computer screen that maybe next year say 5% say that seemed so cool that they're going to attend in person. I'm just throwing #s out there so please bare with me. Maybe the following year they take their neighbor and his kid who shoot baskets with the wrestler in the tourney and their like "whoa...that was cool" and then maybe that kid goes to his wrestling club and digs it! Do #'s manifest over nite? No but over time they might. Kinda hard to sit here and read about how we need more weekday duals to grow the sport when we have the second coolest event this week to showcase to those on the fringes but we don't want to utilize 21st century technology to put it out to the masses for a FEE ie REVENUE because they are, in your opinion, already connected to the sport and should be made to drive/fly/buggy to the event. My Ball U degree ain't in marketing or English but I do believe revenue does drive growth. I recall a lot of these 1A-2A schools saying their participation in this event helped them immensely as far as interest and participation. In your scenario, those participants this year should be the only ones who get to experience it via attendance in person (since they are connected). What if their small community rival that they lost to by 2 forfeits had 3 kids that got to watch it on track (since they're hours away and don't feel like driving..or can't cuz, you know, they don't have a license yet!) and saw how fun it was and got 2 of his buddies interested because they saw it for $10? So they see it via streaming and get 2 of those kids into the sport and don't forfeit a couple years from now and maybe get into the event..that's not growth? Seems shortsighted. There were 873 subscriptions for TrackCast last year for the Individual State Finals (@ $10). I am aware that some of that probably had to do with the Lee v. Red match but still that is a good amount of people we reached that were unable (or able to go and wanted to watch the replay of the matches). I would imagine that Evansville people would be more than happy to throw $30 towards a stream instead of driving, getting a hotel, and paying admission (which would be $30 for 2 people). Maybe I am wrong, but I do not actually see this harming our attendance as the people who were already planning to go, would. And the people who were not, would have the ability to go. Now I am sure there will be teams periscoping, Twitter Live-ing, and Facebook Live-ing so that their fans back at home are able to watch. I just see it as a missed opportunity. Here here, trackgopher speaks the truth! With the location being where it is along with near Christmas time the IHSWCA is missing out on another revenue stream. It also helps having handsome and well spoken announcers like the finals of the ihpo had. Those guys were great. That is very short-sighted. Friends, cousins, aunts and uncles are fans of the kids that wrestle and would like to see theirs wrestle. Those are the people who may not be heavily exposed to the sport who might pay to watch a stream. Discounting the revenue aspect, those are the people who could become wrestling fans. Those are the people who might have a youngin' that gets introduced to the sport or encouraged to try wrestling. Thinking that it could have no influence on the sport is simply myopic and wrong. That said, growing the sport and even revenue is NOT the reason this should be done. It is simply providing a way to allow those to watch these kids that put in so much work that couldn't otherwise. Unless it is extremely cost-prohibitive, and I have not heard any indication that is the case, then goodwill and rewarding the kids who do all the work is the reason to do it. In my opinion, it is a slap in the face to the wrestlers themselves that the technology exists to allow those friends, grandparents, extended family, etc to watch and it is not utilized. Not to mention you choose to have the event in Ft. Wayne (I get that) and not everybody is within an hour drive. So I would ask whoever made this decision, that if it can be reversed, to do so quickly. OR provide publicly ONE really good reason for not doing so! Personally... my wife's mom passed a week after thanksgiving. She used all of her personal time dealing with that. With this said, she can't go on Friday. It would be great if she could watch. Portage vs EMD...might be the only pool play intrigue for advancement. Anybody want to do potential lineup/matchups/outcomes/score? Guess it might be moot til tomorrow and Moran availability is shown? Castle wrestled EMD within 5 points and Penn will be the closest they've been to their genuine lineup. Avon and PM are favorites, but there's definitely intrigue in those matchups. Will respectfully disagree and leave it at that. SWINFAN makes great points, especially after last years complaints on seating and sight lines for fans (which probably have been fixed). Seating situation is excellent this year!